Recent media speculation regarding upcoming assay results increased trading activity in Adriatic Metals (ASX:ADT) in the lead up to Monday, July 16, 2018. 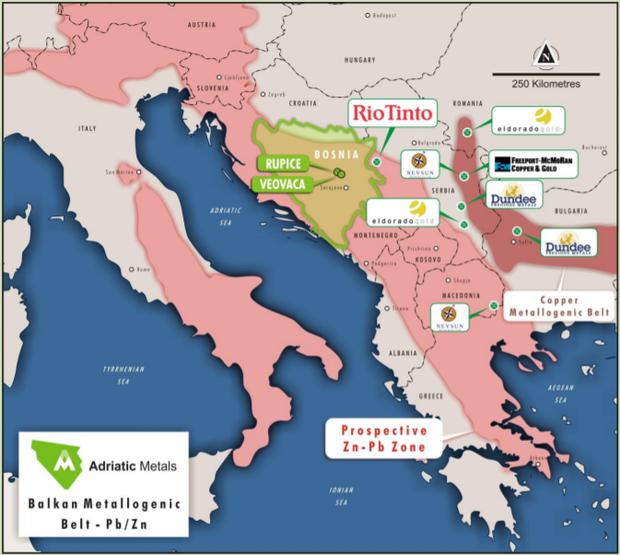 Speculation surrounded the anticipated timing of release of assay results for BR-4-18 and BR-5-18 at the company’s Rupice polymetallic project in Bosnia. As a backdrop, the project comprises a historic open cut zinc/lead/barite and silver mine at Veovaca and Rupice, an advanced proximal deposit which exhibits exceptionally high-grades of base and precious metals. 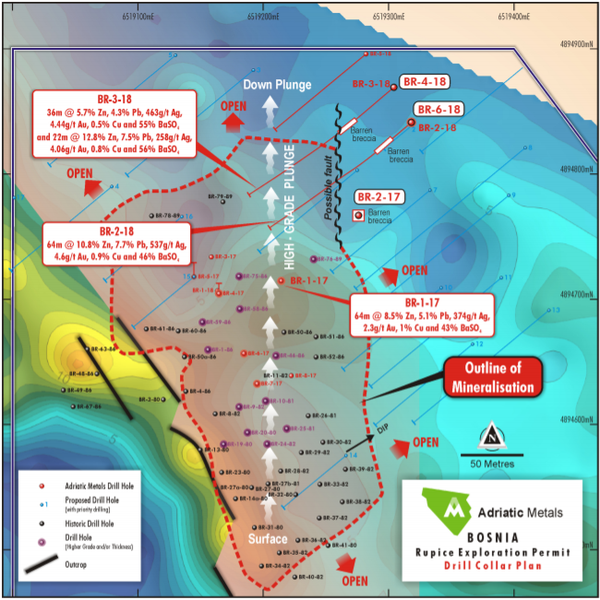 Adriatic’s short-term aim is to expand the current JORC Resource at Veovaca and to complete an in-fill drilling programme at the high-grade Rupice deposit. After the market closed on Monday, management was able to appraise investors of assay results from the recent hole BR-4-18, and the company also advised that the drilling of BR-6-18 had been completed. Importantly, these results as shown below are part of the company’s 15,000 metre drilling program, and as such should not be considered in isolation, but considered in the context of other data as illustrated on the mapped area. Significantly, only limited drilling to date has already resulted in extensions to known mineralisation, as well as confirmation that the resource remains open at substantial widths in several directions. The current drill program including the recent three holes leading up to BR-4-18 enhanced Adriatic’s understanding of the stratigraphic and structural controls on mineralisation at Rupice North. The company will further investigate the eastern flank of Rupice North based after examining this recent data. On this note, ADT’s CEO, Geraint Harris highlighted the importance of upcoming results from BR-5-18 in saying, “This information will help us to understand the down-dip potential at Rupice and whether these holes represent an isolated embayment in the mineralisation or a more significant eastern boundary. “However, the mineralisation remains very much open in all directions, and we eagerly await the results for BR-5-18 which sought to test the down plunge extension. Importantly, Harris has extensive experience in managing projects across Europe, Asia and former Soviet regions. There appears little doubt that the degree of speculation leading up to the release of upcoming assay results which resulted in the company’s shares soaring circa 25 per cent in recent weeks was accentuated by the company’s success in early drilling. BR-3-18 returned thick intercepts of high grade mineralisation, with particularly robust zinc grades. These included 36 metres grading 4.4 g/t gold and 5.7 per cent zinc and 22 metres at 4.1 g/t gold, but extremely high-grade zinc of 12.8 per cent. It is also worth noting that within those two intercepts, zinc grades of 11.6 per cent and 22.1 per cent were delineated. 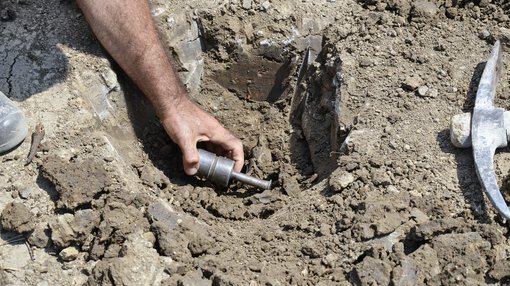 These drill results culminated in a significant extension to the north and notably down dip at the Rupice North Zone. Management expects a continuation of step out drilling will substantially expand its knowledge of the broader deposit, as well as the highly mineralised zone recently defined. The fact that the mineralised zone remains open at substantial widths in several directions provides the company with numerous options in terms of exploration targets. Management confirmed that it currently has three rigs drilling operating at Rupice, and intends to bring a fourth rig to site as soon as possible, a move that will enable it to thoroughly drill test in all directions. Areas such as Bosnia, Serbia, Romania and Bulgaria are attracting plenty of attention from the big corporates as the area has been identified as highly prospective for base and precious metals with limited exploration. Its popularity is demonstrated in the following map of the broader region. Adriatic has a strong board with experience in managing large projects for multinationals. Of particular importance given the company’s zinc focus and project location is the experience that chief executive Geraint Harris’ brings to the table. Harris worked and lived in numerous countries across his career including Europe, North and South America, Central Asia, former Soviet Union and China. He was also manager mine services for Lisheen (high grade U/G) in Ireland, one of the biggest zinc mines in the world until its recent closure. Providing an extra boost was the introduction of Sandfire Resources (ASX:SFR) as a new cornerstone investor and strategic partner. Not only does Sandfire’s management team have an extensive working knowledge of a multi-commodity mining production operations, but it brings technical and commercial expertise, including financing experience.